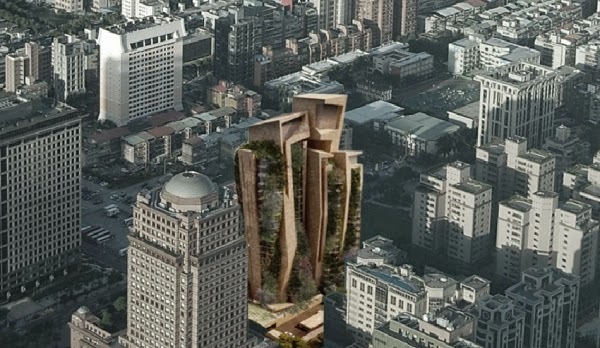 A proposed skyscraper that combines rock and plant in Taiwan designed by Fernando Menis Archi-new - Free Dwg file Blocks Cad autocad architecture. Archi-new 3D Dwg - Free Dwg file Blocks Cad autocad architecture. Architect Fernando Menis Fernando Menis developed a concept tower residential complex walls resemble rocks with curved swimming pool and plants grow from their windows as among the rocks. "The perception of this housing project such as mainstreaming between nature in a vacuum primitive earth and rocks emerging from the ground. As if they have always been there, it creates a coherent elements are not limited by time, where sizes and hugging each other generating plants volume that contains spacious apartments." According to the architect. The proposed consists of a grouping of two towers online, stretching along the 25-storey architectural design, including different types of apartments ranging in size from 250 to 550, 750 and 1000 square meters. How organic cement which is material to the outside of the building interior Fragath to create living rooms resemble caves continue. Elevator vehicles supplied to the tower also allows residents to raise their cars parked inside their homes. The architectural distributed social spaces behind the hanging gardens that encourages occupants to communicate. There are also spaces the club and swimming pool and relax on the upper floors.